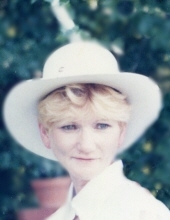 Mrs. Nancy Ann Hair Trantham, 67, of Linden died Wednesday April 10, 2019 at Rex Hospital in Raleigh. She was born October 26, 1951 in Cumberland County daughter of the late Major Allen and Annie Belle Cumbee Hair. She was also preceded in death by brothers, Johnny and Robert Hair and sister-in-law, Joyce Hair. Nancy was retired from the Veterans Administration Hospital in Fayetteville where she had worked for twenty-nine years and had painted murals in the hospital. A funeral service will be held 2 pm, Saturday April 13, 2019 at Collier’s Chapel Church in Linden with Rev. Johnny Haney officiating. Nancy is survived by her husband, James H. Trantham, Jr. of Linden; son, Steven Caspelich and wife Iritta of Knoxville, TN; daughter Sylvia Stewart of Linden; brothers, Allen Hair and wife Gail of Linden, David Earl Hair of Linden; sister, Eleanor Hair of Lillington; granddaughter, Summer Vanderpool of Lillington; and sister-in-law, Donna Hair Williams of Linden. The family will receive friends from 1 - 2 p.m. prior to the service at the church. In lieu of flowers memorials may be made to the North Carolina Lions, Inc. P.O. Box 39 Sherrills Ford, N.C. 28673. To send flowers or a remembrance gift to the family of Nancy Ann Hair Trantham, please visit our Tribute Store. "Email Address" would like to share the life celebration of Nancy Ann Hair Trantham. Click on the "link" to go to share a favorite memory or leave a condolence message for the family.